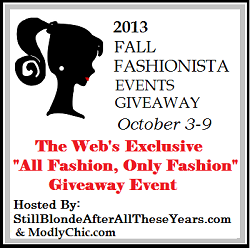 Still Blonde after all these YEARS, Modly Chic, K Squared Glamour , Fall Fashionista Events Giveaway or the Fall Fashionista Events Giveaway bloggers are not responsible for sponsors/bloggers that do not fulfill their prizes or for any product failure or harm caused thereby. I would pick the Lauren. Bronze leopard Megan dress with 3/4 sleeves is right up my alley. I like the "Penelope" or the "megan". I always tend to go for the vee-neck styles. I just think they are more flattering on me. I'd like the silver python Audrey dress. Thanks. I like the Ruby dress in moss. The Carmen dress is very nice. May choose that one. I love their dresses. I really like the carmen 3/4 sleeve in turquoise blossoms! I like the lauren. Very Class! I would love the Marisa dress in Blueberry Feathers pattern. I'd probably get the 3/4 sleeved Sophie dress. It's a nice length. Thanks for the giveaway. I might get the penelope dress, I'm not sure which print tho. I like the Audrey Dress. If I won, I might pick the Ruby 3/4 sleeve in moss. I like the megan dress. The burnt orange with geometric pattern is beautiful! I like the Penelope dress. I would choose the Clara!! I love the penelope dress - so cute! thanks for the chance! I might pick the MEGAN. I think I would choose the long sleeve josie dress in the lime houndstooth print! I would pick the Carolyn - Gold Marble, gorgeous dress! I Love the Lauren dress!! I like the Clara dress. My favorite is the Ruby style. I like the ella style. I'd like the Gala Wrap in Scarlet Graffiti. I would like a 3/4 sleeve Megan. I would choose the Megan dress. I would choose the Carolyn dress in gold marble. I would choose Audrey... which also happens to be my Grandmother's name. I LOVE the gala ~ 3/4 sleeve - Aubergine!! I'd pick the Ruby in Moss color. If I won, I would pick the Gala 3 / 4 sleeve dress in Violet Floral. The Penelope dress, very cute! I would get the Clara dress. I would pick the Audrey dress. I'd choose the Gala 3/4 sleeve dress in grey/blue! So elegant! I like Clara. With 3/4 sleeves. I like The Megan in Brown w/cream dots. I'm pretty sure that it's my favorite out of all of them. nora or penelope! In green houndstooth! I would choose the Lauren 3/4 sleeve in burnt orange geo. Audrey in Dahlia. Amazing dresses! I would choose the Rita dress. I like all the Karina dresses. However, I love the Marisa dresses. They do remind me of dresses from the 1950s, which has always been a favorite of mine - absolutely beautiful. I would choose, the Gala Wrap... beautiful. I like the Ruby dress. I like the Lauren dress. I like the Josie, Rita and Penelope. The Lauren dress is my favorite. I really like the Lauren. If I won, I would pick one of the Audrey dresses! i would choose the audrey dress. Is all of them a valid answer? <3 Karina dresses...but if I have to choose one it would be the Julie. So wearable! I like the penelope...I think the cut would be good!, I also really like the dress you have on in the picture! I would choose the Megan in the Brown and Green Decorative Stripes. Hello, I like the Julie-long sleeve in Grey Houndstooth Ponte. Thanks for a great giveaway! I like the Lauren in black. I would buy the Audrey dress in Firecracker! If I won I would get the long sleeve Josie dress. I would love Ruby in Chocolate! I like the Rita dress. I love the Gala in either of the blues. I'm not sure yet, but I'm leaning towards the Clara. I would choose the Rita, 3/4 sleeve. Thanks so much for the chance to win, Lisa, and for all of your hard work. Dress looks awesome on you, by the way! I'd get the Clara dress in Silver Shimmer! I love the clara dress! I would probably go with the Lauren dress. I would choose the lauren dress. I like the Lauren style dress. I LOVE the Josie dress. I would choose the Clara. I like the ruby 3/4 sleeve. I like the Purple Plaid Penelope dress. Thanks for the chance to win! I think I would go with the Nora in autumn aztec print. I would like the Megan dress. I might go with the Clara! Very cute! I love the look of the Carmen dress, so pretty and I love the waistline! It would be a three way cat fight between Audrey Clara and Megan....all are lovely! I would probably choose the daisy dress style. I'd choose the daisy wrap dress. I love the royal blue Lauren dress. LAUREN in Blue or Black. I'd choose the Audrey! Thank you! I would choose the black rita 3/4 length dress. audrey for my daughter. She would love it. I'd love the Clara dress. I really like the Penelope! I love the Gala dress! I love the Audrey Dress! I would pick the Audry! I would pick the Megan dress. I would choose the Ella Winter White Stripe dress. It would be great to win a choice of Karina Dress. I would choose the Audrey but there are a lot of pretty dresses.